Created in Photoshop, HTML5, CSS3. 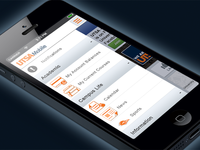 This is one of the "What's New" splashscreens we push out to the UTSA Mobile app announcing a new featured module. It's actually in a webpage, designed with breakpoints for mobile, tablet, desktop.